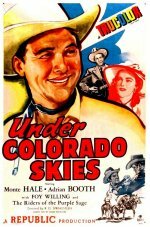 Filmed in "glorious" Trucolor, a low-budget substitute for Technicolor, Under Colorado Skies remains a standard B-Western, neither better nor worse than the majority of late-1940s sagebrush fare from genre specialist Republic Pictures. Monte Hale stars as a medical student moonlighting as a bank teller. Arriving on the scene in the middle of a robbery, Hale discovers that one of the bandits (John Alvin) is the brother of his girlfriend (Adrian Booth). To shield the wayward youth from prosecution, our hero accepts blame for both the robbery and the death of the bank's owner (Raymond Bond), but manages to escape on the way to jail. Hooking up with entertainers Foy Willing & the Riders of the Purple Sage, he then goes undercover as a performer in a saloon owned by Paul Hurst. Learning the whereabouts of the bandits, Monte fakes his own death and is later able to flush out their leader, the nefarious William Haade. As always, Hale does well in both the fistfights and as a balladeer, accompanied here by Foy Willing and the Riders in such selections as "San Antonio Rose", by Bob Wills, "Holiday for the Blues", by Willing and Sid Robin, and "Wait for the Wagon", by George P. Knauff and Sid Robin. In one of her eight westerns with Hale, Adrian Booth is, as always, a fetching sight and the veteran Paul Hurst makes a welcome addition to the Hale oeuvre. Hurst would go on to appear in all but one of Hale's subsequent vehicles, providing his own brand of homey comic relief.